Engineers at AMG Performance Studio began building cars for Mercedes-Benz in 2006. They spared no expense and the resulting automobiles were very rare and frightfully fast. These exclusive cars bore an equally fearsome moniker: Black Series. 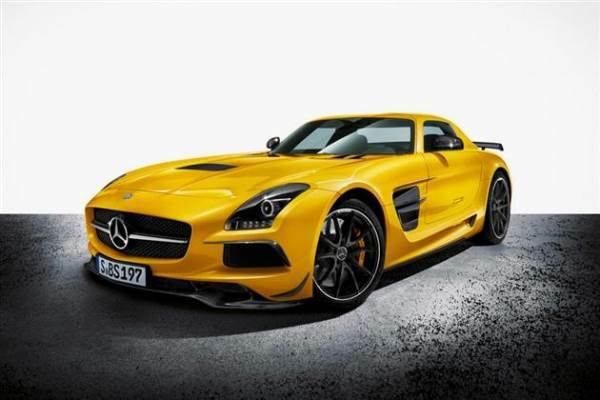 Only five Black Series models have ever been produced, the latest being the 2014 SLS AMG Black Series. At $294,000 it represents a $76,100 premium over the SLS GT, but you get 622 hp and 468 lb-ft of torque from the hand-built, 6.3-litre V8. A rear-mounted, 7-speed dual-clutch transmission transfers power to the rear wheels. Huge carbon-ceramic discs, forged wheels and ultra-wide Michelin Pilot Sport Cup 2 tires, and stiff adaptive suspension mean this car is designed more for the racetrack than for cruising the streets. This racecar with turn signals is available in very limited numbers, and it seems they’re already spoken for, so ownership may be only but a dream.